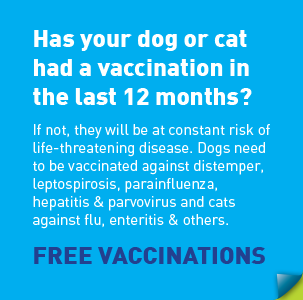 Has your dog or cat had a vaccination in the last 12 months? If not, they will be at constant risk of life-threatening disease. Dogs need to be vaccinated against distemper, leptospirosis, parainfluenza, hepatitis and parvovirus and cats against flu, enteritis and feline leukaemia virus. At the Oaks, when we vaccinate your pet we include a complete health check and examination and can advise you on everything from food and training, to flea and worm control. Our highly experienced vets will be able to pick up on any other problems that are affecting your pet and deal with them at an early stage. We will also send you reminders by post or text to ensure you never forget again! Call us and book an appointment today. We also have some dog and kitty care sheets on this site which might be of interest to you. You can download them from here.